@MR.GAM3R what happened to my request? “We Are Number One” by MG - King of Random. Made using the free Hopscotch app! I apologise if it doesn't sound right. I think the MIDI file included a drum file which obviously won't work in Hopscotch. Oooh, I don't know much about MIDI files or anything in general, but does/can your hack tool use the drum sounds in Hopscotch? I'm not exactly sure how MIDI files work or what you mean by this, but maybe it would be possible to make presets for every possible outcome..? Would it be too tedious of a task? Tag me at @MR.GAM3R so I see your request. @Mr.rex @hopscotch_king ok your requests coming up! Yeah sure! What song you do want? Still workin on Nyeh Heh Heh? 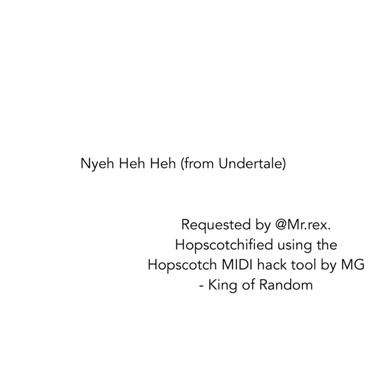 “Nyeh Heh Heh” by MG - King of Random. Made using the free Hopscotch app! 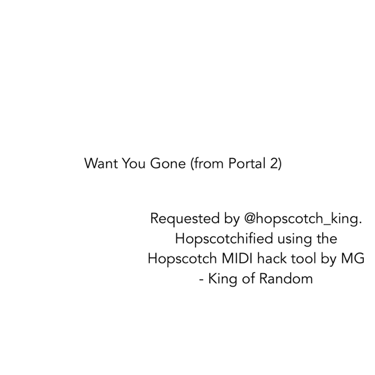 “Want You Gone” by MG - King of Random. Made using the free Hopscotch app! @t1_hopscotch does this website work for you? I tried uploaded a file but nothing happened. @Sweetlina ok your request is coming. I just a MIDI file for that song. @MR.GAM3R I'm so sorry I realise I phrased this^ weirdly before. What I meant was, that me having a Hopscotch project with the Green Hill Zone theme would be useless because I wouldn't use it for anything, so I decided it wasn't worth the effort of converting it into a Hopscotch project.